A ferry operator accidentally pumped contaminated sea water into fresh water drinking supplies on the Isle of Man, an investigation has revealed. Residents and businesses around North Quay in Douglas had to avoid using tap water for drinking for 24 hours on 7 December. Contaminated water was pumped into a fresh water mains supply during the routine cleaning of a ferry. 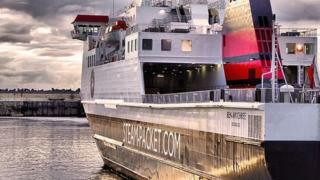 The Isle of Man Steam Packet Company said it was a "genuine accident". Manx Utilities Authority (MUA) Chairman Dr Alex Allinson apologised. He said the MUA were alerted to the issue after a complaint from a restaurant, and technical amendments had been made to the cleaning system as a precaution. An MUA investigation revealed the incident happened while the Ben-my-Chree was cleaned. Steam Packet's chief executive Mark Woodward said the problem had never happened before and both the Steam Packet Company and Manx Utilities were working together to ensure it "cannot reoccur".